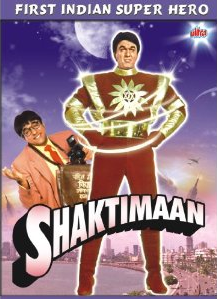 After finishing off Electric Man, Shaktimaan needs to fight against the another major threat to the mankind, his new enemy Kapaala (or Kapala). In the previous 3 episodes of this TV Serial we saw that How Shaktimaan finally saves the mankind from the electric man. He is also a normal human being like all others. There is nothing superior than the truth. Shaktimaan himself is a fan of those who stands for the truth and noble work. One needs to eat simple and healthy food to live a healthy life. Yoga, Exercise, Meditation and other such activities can help one to explore his/her inner strength. Study is a very important thing. If this TV serial has nothing else to offer than this small meeting of Shaktimaan with the kids, then also the DVD set of Shaktimaan is worth to have in your personal home video library collection. Shaktiman never tries taking the kids into the world of magic or fantasy. It rather suggest doing what it is proper and correct. A very few superheroes can be found which are so grounded to the Earth! Episode 8-10 of this serial brings in a new Enemy of mankind, Kapala. He was in the get-up of a sage. It gives you that message that outer look of a person can be misleading. Simply as we say, One cannon judge the book from its cover. Kapala was blessed with a device which has the ability to grab the power of his opponent!, which makes him invincible. This idea is inspired from the tales of Jalandhar (and Lord Shiva), and Vali (brother of Sugriv – from -Ramayana); the mythological characters from ancient Indian literature. Also the acts of Kapala to raise fear in the people’s heart and mind, are quite philosophical as well. He drags the people into the world of illusion. One must needs to be in the world of reality to fight the illusion. Also the addiction of playing video games and how to overcome it by physical activities like sports and other stuff is indirectly suggested. Via the character of JJ you see that how genuine man he was, till taken over by the dark forces. It is a metaphor of the fact that once a soul is corrupted, it cannot realize what is good and what is bad, what one should do and what one shouldn’t. So one should take all the care to keep his inner self to remain unaffected from the outer sources. It is also illustrated that the media has a great power to convey the facts to the people. If it is used positively it affects the society in the same way, and it can be used to spread wrong information as well. It convey two things, if you have the power, use it the proper way; and don’t trust everything you are conveyed, be alert to know the facts. During the encounter of Shkatimaan with Kapala you clearly see the that when they start fighting, Kapala hadn’t wear the “power/strength grabbing device” but all of the sudden it appears on his chest. This is a mistake and the director should have taken care of the same. The special effects are unconvincing at various places. For example the intro to Kapala – scene itself. And yes, during the fight between Shaktimaan and Kapala there are more such special effects scenes there. Also the actor playing JJ, his secretary, his girl-friend needs a lot of improvements in their acting. Also many of actors who play the office staff of Geeta’s newspaper are unconvincing too. Mukesh Khanna and Kitu Gidwani are the most convincing actors in all these episodes. They deliver splendid performances. Well, these were the highs and lows of the episodes showing Kapala v/s Shaktimaan. Where highs are definitely considerable than the lows. Yes the background music is a positive addition too. The TV serial is definitely worth watching. It conveys the message of morals and ethics very convincingly in simple manner. Not only kids, but everyone should watch such genuine stuff. The makers of such TV serial are appreciated.